In broad response to a number of questions I've gotten since last week: “Yes" I plan to try and do this every day—Monday through Friday”—and “no,” it's not because I feel like I have “something to say” as much as I feel like I have something I “want to share.” Yes, I know, each song has been accompanied by some little personal anecdote or scrap of musical verbosity, but I can't promise that's always gonna be the case. I doubt you'll ever get just a music file from me, but you might receive a song for no other reason than: I really like it and I really want you to hear it. Don't get me wrong, when I look at my music collection in all its many mediums, I can “hear” as many stories associated with those bands; those records; those picture sleeves; those 12” imports; those compilation cassettes; those lyric sheets, as I can great music. Indeed it never ceases to amaze me how these things have weathered the journey so far with me, and still continue to: take me by surprise, offer solace, make me sad, raise my spirits, move my feet, astound me, and give me inspiration. In that respect, what I have to say is more or less beside the point. The point (at least today, anyway) is rolling drum beats, fast-strummed guitars, glorious 2-part harmony, the gratuitous pleasure of just yelling “Hey” to punctuate a refrain, and a happy, toe-tapping homage to one of the “lesser” days-of-the-week—Wednesday—the hump day. How can something so trivial be so essential in two minutes and six seconds? Action Now is a California quartet from the early ’80's with one record to their name: All Your Dreams…and More. 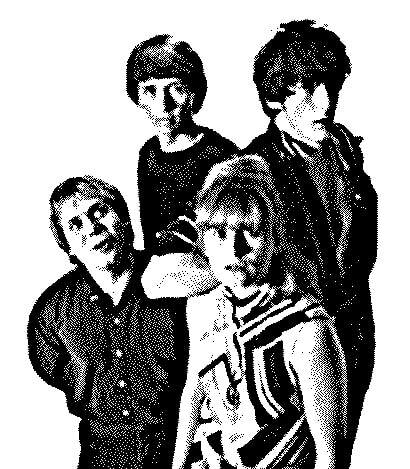 The driving force behind the band was Paula Pierce who later went on to form the all girl psychedelic garage band, The Pandoras. “When Wednesday Comes” is today's Happy Medium Song of the Day.